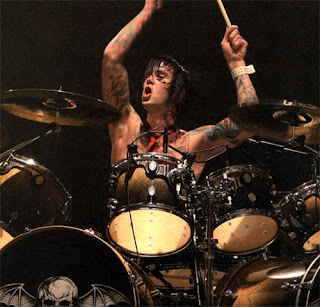 James Owen Sullivan, the drummer with California band Avenged Sevenfold, was found dead on Monday, according to police. He was 28. Sullivan was found "unresponsive" in his Huntington Beach home, according to Orange County deputy coroner Mitchell Sigal. An autopsy has been scheduled to determine cause of death. A message posted Monday on the band's website confirmed his death. "It is with great sadness and heavy hearts that we tell you of the passing today of Jimmy (The Rev) Sullivan," the statement said. "Jimmy was not only one of the world's best drummers, but more importantly he was our best friend and brother." Sullivan was backup vocalist and drummer for Avenged Sevenfold, a band with a punk-goth sensibility that was voted best new artist at the 2006 MTV Music Video Awards. He provided the high-speed beat behind songs such as Almost Easy and Scream. He was a founding member of the band, formed in 1999, with guitarist Zacky Vengeance, lead guitarist Synyster Gates, lead singer M. Shadows and bassist Johnny Christ. Sullivan wrote some of the band's tongue-in-cheek songs, such as A Little Piece of Heaven. Early on, band members were known for their experimentation with drugs and enjoying the rock 'n' roll lifestyle, but played down that image with the commercial success of albums such as 2005's City of Evil and 2007's Avenged Sevenfold.